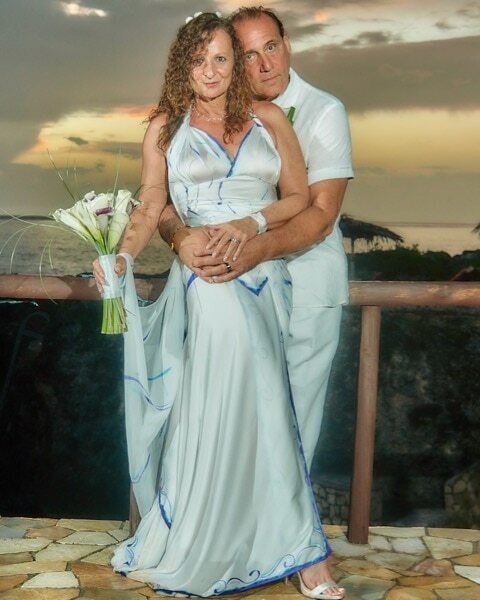 I was not your “average” bride being that this was my second marriage and I was 55 at the time of engagement. I wanted this wedding to be special and yet not typical. 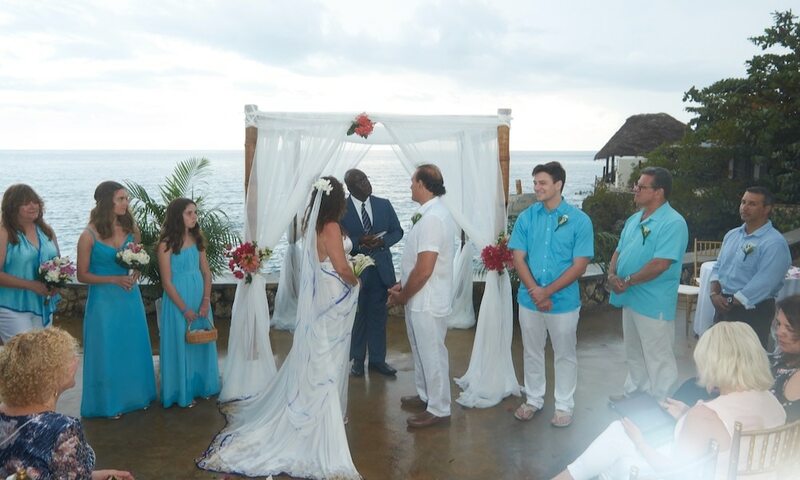 We knew we wanted to get married in Jamaica so that alone would make it special to us. I didn’t want to set the date until I found the dress! 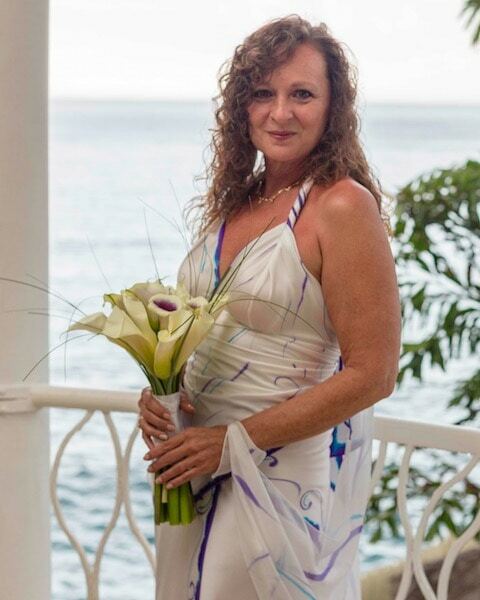 The dress was going to be the most important thing and had to be right at my age and being in the tropics. I searched probably every wedding gown site in existence and every designer for a year with no luck! 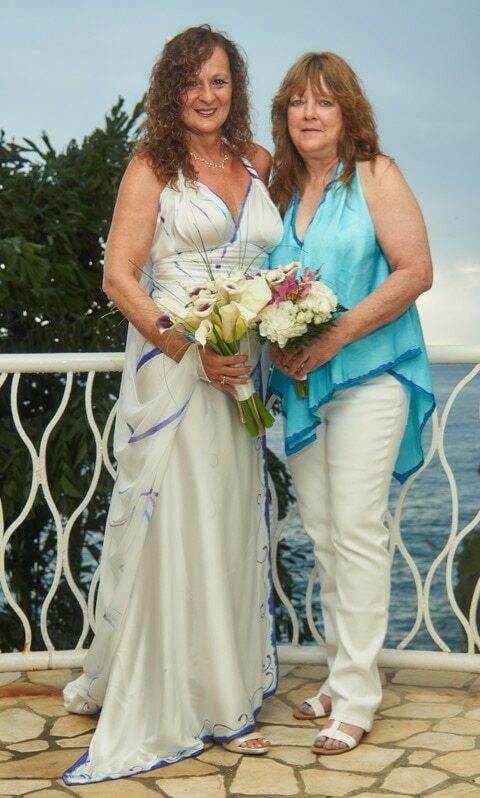 I just couldn’t wear a traditional white gown in my eyes and tried just about every search title I could think of; beach wedding gowns, unusual wedding gowns, colored wedding gowns, etc. I actually got to the point of giving up when I pulled all the pictures of beach weddings on Pinterest! I am really not connected to sites like that so didn’t know what it was. I started looking at pictures thinking, “I’m never going to get married!”, when I saw the most beautiful unusual purple gown on a model posed on what looked like Hawaiian lava oceanside cliffs. My heart jumped for the first time as I thought, “Surely this designer would have something for me!” I opened the picture and below was Jasmine Sky Designs so I googled her. All The Beautiful Hand Painted Art Work! The web site was so easy to navigate and I was overwhelmed with all the beautiful hand painted art work on the dresses! Being an artist myself I had an appreciation for the work that went into each design. I was just so excited because I knew I had found the right person for my dress!! I filled out the contact form and waited to hear from Jasmine. Within 24 hours I was contacted with a questionnaire and instructions to send pictures of myself along with all my measurements. An Artistic Expression of My Personality! As I filled out the questionnaire it became obvious to me that this was not just a garment. It was an artistic extension of my personality!! Within a couple of more days we were on the phone talking about everything from art to who I really am!! We then got onto the web site pulled all her dresses and talked about body types and what dress would be the best for me. The one I had originally seen was a bit expensive for me so we looked at others and decided on a few that Jasmine thought would fit me the best. Now let me say, just sending pictures and taking measurements gave me a real reality check. It made me realize that I had to lose some weight. I credit Jasmine for my life style change and a 20 lb weight loss. The before and after pictures are actually amazing to me and I kept them so as to never put that weight back on. There were 2 dresses that I liked but I wanted to try them on so I used Jasmine’s Virtual Fitting Service where she sends her samples to you so you can try them on. The two different samples arrived quickly and we did FaceTime to have an in-person fitting. After trying both samples on, I decided on Eleganza! Actually, I was glad I got the two samples to try on because one had a veil and the other one didn’t. I had Jasmine make me the veil to match my Eleganza. I wanted a one-of-a-kind dress, so together, Jasmine and I drew different designs to find what would look the best for me. At one point I was not sure and the guidance I received from Jasmine was irreplaceable! We FaceTimed in my closet to look at existing colors I wear and what colors looked best on me. I don’t know what I would have done without Jasmine and, by the end, I felt like I had a best friend as well as designer! 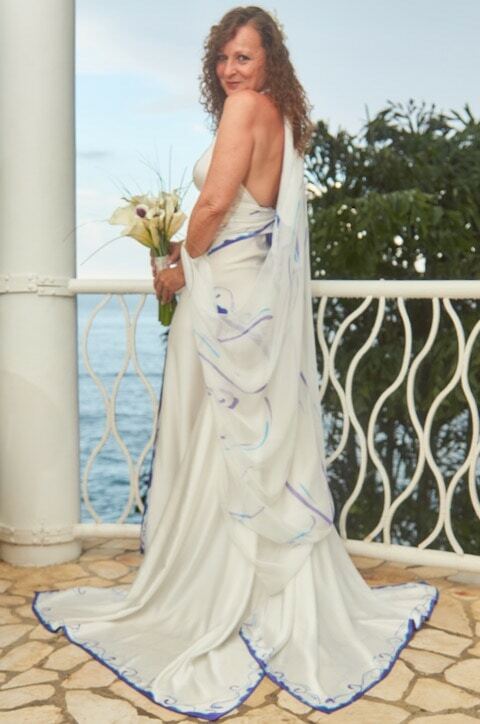 The dress arrived and I had a one of a kind walking piece of silk art wear!! We FaceTimed again to put the dress on and try different ways to wear it! One of the things I love about my art wear is that I can wear it in so many different ways!! The silk, the quality of the stitching and the hand painting was stunning! Jasmine also made me palazzo pants to wear for my reception because it had a train and I didn’t want to wear that for my whole reception. I had a one-of-a-kind dress that could be worn so many ways and I truly took advantage of that!! 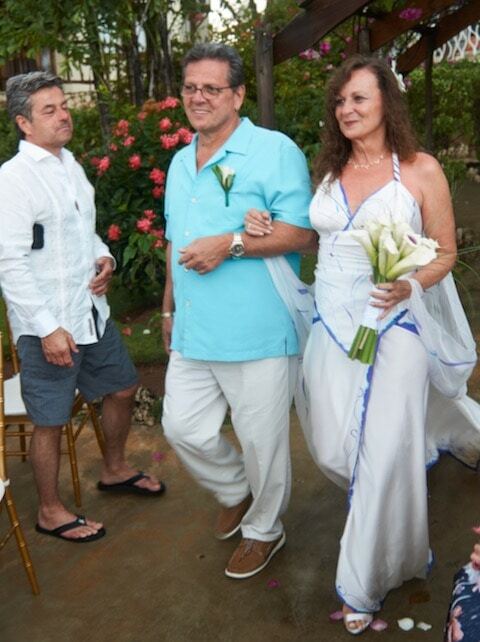 I was 57 when I finally walked down that aisle. Not only did I feel beautiful in that dress but Jasmine somehow made me 20 lbs lighter and 20 years younger!! 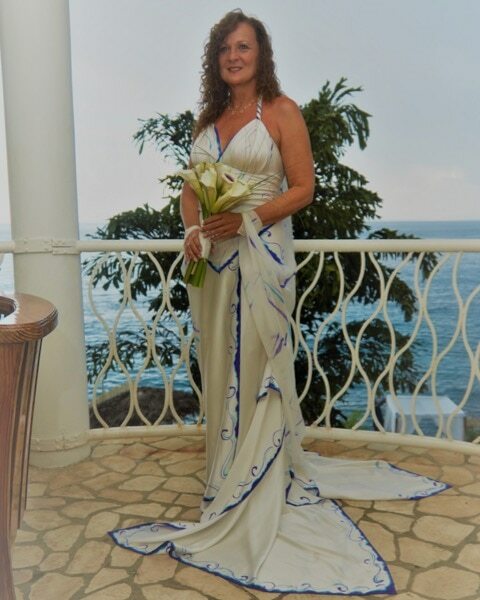 I would recommend Jasmine Sky Designs to anyone that wants a one-of-a-kind, outrageously beautiful wedding dress that people will talk about for years! They are still taking about mine 10 months later!